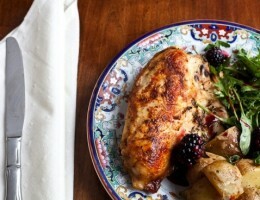 By Grande Chef Otto, CHICAGO – The great thing about chicken is it’s so versatile. It’s legal, in my mind, to do just about anything to a chicken, and if you’re not particularly religious or a clean freak of some sort, I’d recommend slipping out while the Google Street View’s not looking and picking up some poulet for some backyard or rooftop cooking. Poulet is what the French call chicken. For years, when I lived in France, I heard about how the versatility of chicken, and I looked forward to breeding and barbequeing my own chickens one day in my own Williamsburg loft while groovin’ to Le Arcade Fire on my iPhone. That day came one March 2nd, in 2009 at 2:00 pm, and ever since I have been chicken crazy. Let me give you one recipe for when your car has a flat and you’re stuck outside in the wilderness with nothing but a chicken. First, take the chicken out of the glove compartment. Then look to see if Google Street View is out and about or if you’ve left your iPhone on. If the coast is clear let your inhibitions go with the chicken in a way appropriate to your age and culture. Next, unwrap the chicken and roast it with your own breath. You may not think this is possible, but then you also did not think you would be stuck alone in a strange place having just engaged in what you’re going to want to call performance art if it shows up later in a job evaluation situation, but in a way appropriate to your age and culture to that chicken. Chicken can be served cold also. Just unwrap straight from the supermarket and serve. Chicken can accompany one around town on fools errands and be weilded to keep fools at arms length from you. Chicken, unlike a hamburger, will not kill you immediately. People say chicken burgers are healthier than hamburgers and they may be right. Chicken can be served at any time of day or night. Hot/cold, fresh/not so fresh, organic or straight off the street. Chickens should not be kept as pets. I don’t like chickens and find them extremely hard to deal with in a kitchen. This article does not advise cooking chicken. The last thing I would wish is for anyone to get the wrong idea and think I’m supporting chicken or forcing it down peoples’ throats. This entry was posted in Grande Chef Otto and tagged chicken is so versatile, france, Google street view, Grande Chef Otto, iphone, poulet, rooftop cooking, the brutal times. Bookmark the permalink. this is challenging stuff, chef. you’ve made me re-think chicken, which i’d sworn off due to the usual. but chicken is still mostly a no-no if i’ve got old folks over. it right ruffles their feathers. oh god, i love chicken. you should tell your readers about library chicken – chickens roasted in library bathrooms. i had the best chicken there.